Ford Focus Electric is the car of near future and rightly reflects the fate of automobile industry. 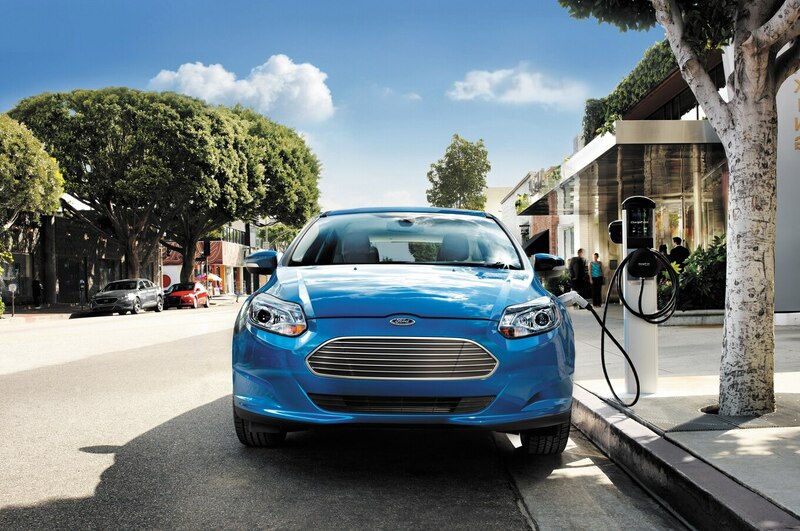 The Ford Focus Electric review will let you understand how this car has evolved over the years. And well does it compete with other strong players present in the electric segment. It’s time to say bye-bye to gas stations and enter the whole new world of fully-electric cars. With the changing times, we witness change in human and nature needs. To keep things work in proper pace it becomes important to keep a balance between the two. In this respect, many new inventions are made that not only satisfy human wants but help keep the nature clean. Out of the many inventions, one was that of the electric cars. They unlike normal cars can stay alive on zero gas, zero oil change along with churning out zero carbon emission. This Ford Focus Electric review will give you in-depth knowledge of one such non-fuel commuter and important member of Ford electric vehicles fleet. Ford Focus Electric is not new name in the automobile world. The car first appeared on the global platform back in 2011. But before that the car made an appearance as a concept vehicle under the name Ford Focus BEV at the 2009 Frankfurt Motor Show. Following year didn’t hear anything from Focus Electric, until when in 2011 its pre-production version was unveiled at 2011 Consumer Electronic Show. And since then this all-electric five-door hatch is going strong specifically in the European and UK market. The reason for its undisputed liking we feel is Ford Focus Electric price that’s competitive in comparison to its rivals. Also, going through Ford Focus Electric specs is a wonder in itself. The car is equipped with all the standard amenities that one needs in a daily commute. Hereunder you’ll find Ford Focus Electric spec details. So, get ready to absorb info in regard to its powertrain, transmission and other things related to its mill mechanism. 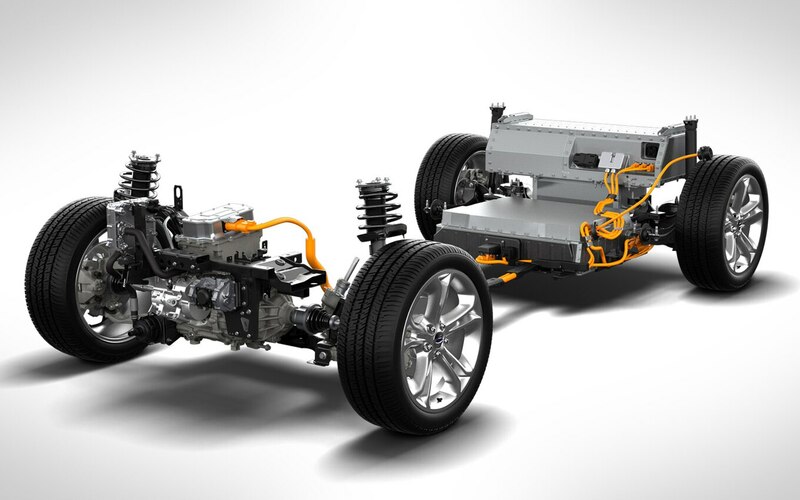 This particular smarty pants from Ford Electric vehicles force house a 107 kW electric motor. The said motor is paired with 23 kWh lithium – ion battery that showcases excellent power holding ability and operational lifetime. All thanks to its motors liquid heated and cooled functionality. This entire setup can be find resting beneath its rear seat and continues all the way to the boot compartment. As for the charging details, the car gets full charge in 3.6 hours, when plugged-in a 240-volt power source. However, when connected to a 120-volt outlet it takes around 20 hours to get full charge. All this in addition to its great economy rating is no less than a treat knowing the price of Ford Focus Electric. As of now, the car is only available in one variant which is priced at $29, 170. The on-road price may vary depending on the dealer and the taxes included in your state or region. As mentioned, this one from Ford misses on the gasoline mill like the one seen powering other Ford Focus models. Focus Electric generates its power through a permanent magnetic electric traction type engine. The said mill is capable of producing a maximum power of 143 hp along with peak torque of 250 Nm. Its liquid cooled lithium-ion battery that works efficiently irrespective of the outside temperature, is responsible for such great power figures. The above mentioned electric motor is powerful enough to carry the added weight of lithium battery. And at the same time deliver performance matching to that of its gasoline siblings. Talking about its range, with one full battery charge the car can only go running for about 122 km. This fact will surely land on the cons section. As its competitors like Nissan Leaf and VW e-Golf have registered far better figures on the range front. But it’s worth mentioning that its 122 km range is consistent irrespective of the climatic conditions. Like other Ford Focus models, supporting Focus Electric sporty driving attitude are present four-wheel independent suspension, self-adjusting shocks and spring. 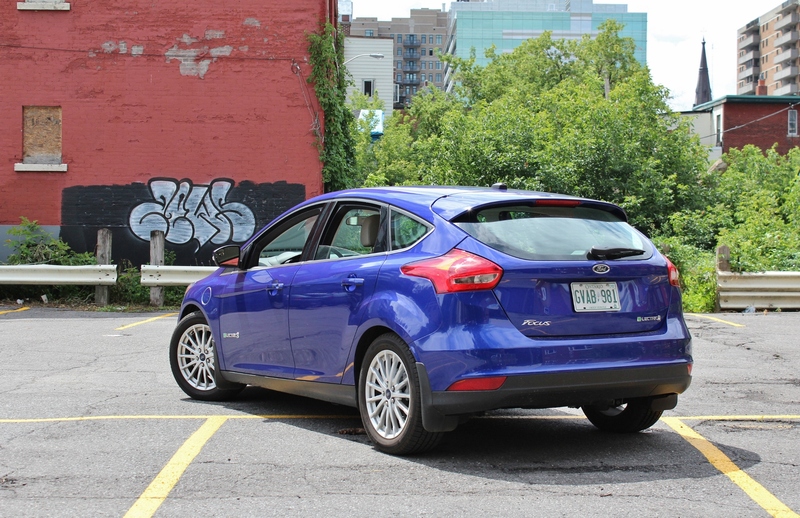 In this review it’s time now to see how Ford Focus Electric price is influenced by its exterior material usage. Focus Electric looks way too similar to the fuel-eater Focus that we see usually roaming around on the roads. The duplication quotient is so high that one cannot immediately distinguish between an electric and nonelectric Focus. In short, Focus Electric wears the same metal sheet and styling attributes as seen on its other family members. First of all at the front are present fully automatic projector high intensity low beam headlamps, large horizontal-bar chrome grille and contoured hood. On to the side are present 17-inch multi spoke aluminium wheels wrapped with P225/50/R17 tires. Further adding style are present body colored door handles and chrome side window trim. But what impressed us the most is its blue LED surround charging port. Focus Electric has an aerodynamic-prone body that helps it with the speed. Features at the rear supporting its aero look are rear roof spoiler, pinched tail gate and distinguishing taillight. In this section we’ll be inspecting the cabin comfort and convenience of this non-gasoline Focus. To be very frank, its interior also holds a striking similarity with the traditional Focus, just like its exterior. It’s only the battery status monitor instead of a normal fuel gauge being the distinguishing factor between the two. Ford Focus Electric spec sheet reads it to be a five-seater passenger car with all standard equipment fitted inside. But here’s a slight bummer, its rear housed electric powertrain eats up a substantial amount of cargo space. As for the upholstery, like other standard Focus this one too is covered with 100% recycled Repreve fabric. All the above-mentioned amenities at-throw-away price are no less than a surprise and treat for the buyers. Ford Focus Electric spec sheet doesn’t showcase high-tech features. And this makes it a bit weak amongst other EV’s present in the market. Its limited cabin amenities includes some standard and customisable features. Later includes features like electroluminescent dash that carries an customisable information screen and MyFord infotainment system. Former enlists a backup camera, dual-zone climate control, push-button start and Sirius satellite radio. Safety is one of the major concern areas of a buyer. The said concerns doubles when he is planning to opt for an EV, as he is skeptical about its safety quotient. But when planning to go for Focus Electric, safety should not be your concern. Here, through the Ford Focus Electric review, we’ll like to inform you about Focus good and recognisable safety standards. The car secured a perfect five in NHTSA safety test in categories including rollover, front crash and side crash. In addition, the car comes with seven standard airbags and was also bestowed with ‘Top Safety Pick’ award by IIHS. Ford Focus Electric review is incomplete without mentioning the strong rivals that it will and has been competing against. On the top of our list is present Volkswagen E-Golf. The car with its torquey motor and good throttle at low speeds have given Focus Electric a good rift. Next, car to feature in this list is Kia’s first all-electric car, Soul EV. This electric Kia with its distinguishing appearance and user-friendly tech aspect has attracted many buyers. Last and what we feel is the strongest one featuring in Focus Electric rival list is Nissan Leaf. Leaf’s futuristic inside-out looks has given Focus electric a run for its money. This Ford Focus Electric review has made one thing clear that the car is a champion in some fields and lacks in others. Most noteworthy is its price that is biggest pro and adding to the list are present attributes like high-quality interior and friendly handling. But we doubt that these pluses will keep the car going for long. Especially seeing its low range and yesteryear tech front and that to when the car is entering fourth-generation.